A common dental procedure to protect decaying teeth from further damage is known as a dental filling. When the enamel of a tooth begins to deteriorate, a dentist is sometimes able to clean away the decayed material and fill the remaining space with filling material to prevent further decay. This process typically takes no more than an hour and can save a patient from significantly worse damage to the tooth resulting in more costly dental procedures including emergency dental services and even tooth extraction. Patients in Springfield, Ardmore, and other nearby Pennsylvania towns should contact AmeriDENTAL Group in Upper Darby, PA the moment they experience tooth pain to prevent a more severe situation. The purpose of a dental filling it to cease tooth decay and strengthen the tooth by filling in the decayed area. If a dentist cleans out a cavity without filling it in afterward, harmful bacteria can re-enter the damaged area and cause more decay or even infect the root of the tooth, which may ultimately require a root canal. If you are suffering from tooth pain or sensitivity to hot or cold foods and liquids, you likely have a cavity. 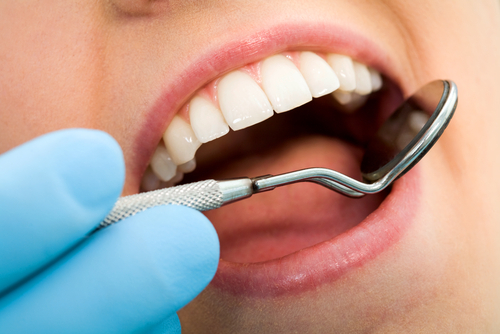 Your dentist will have to examine the tooth to determine if a cavity exists and to what extent the tooth is decayed. By inspecting your teeth and using an X-ray to get detailed images of the cavity, your dentist will be able to decide if a filling is necessary. If the decay has not yet reached the root or consumed a significant portion of the tooth, you may be able to get a simple dental filling to fix the problem. The dental filling procedure is relatively painless. Other than the initial shots to numb the area of the mouth by the cavity, the cleaning and filling process should not cause patients much discomfort. First, the dentist will use a topical numbing gel to soothe the gums near the cavity. Next, he or she will inject the gums with an anesthetic to thoroughly numb the area. After a few minutes, the mouth should be numb, and the dentist will begin to clean away the decay by hand using specialized dental instruments. Once the decay is removed entirely, the dentist will fill the space with a filling material to protect the tooth from infection. When the filling material sets, the dentist will polish the filling until it is comfortable to the bite, flush with the top of the tooth. At this point, the procedure is finished, although the numbness may take a few hours to wear off. What Are the Different Filling Materials I Can Choose? Composite/Plastic: Composite resins are typically the least expensive filling material. Because they blend in better than metal fillings, they are preferred by many patients. They are commonly used for smaller cavities as they are stain more easily than other filling materials and have a tendency to chip over time. These fillings usually last 5-8 years. Amalgam/Silver: Fillings made of silver, tin, mercury, or copper are more durable than composite fillings and last anywhere from 10-15 years on average. Gold: Fillings made from gold can last up to 20 years or more. They blend in better than silver or other metal materials. However, they tend to be more expensive composite or amalgam fillings. Porcelain: Often called in-lays, dental fillings made of porcelain have the strength of a gold filling while blending in like a composite. While they are similarly priced to gold fillings, these made-to-order fillings are natural-looking and very durable. If you have tooth pain, waiting to do something about it may result in more severe dental problems. It is best to check checked out by a trusted team of dentists near Ardmore and Springfield, PA before the cavity worsens. To schedule your next dental cleaning with AmeriDENTAL Group in Upper Darby, PA, give us a call today at 484-971-6351.